I was told through the grapevine that CVS is leaving, and that Trader Joe's will inhabit the old CVS red brick building. My only problem is that I have not been able to verify the information. Does anybody know how to verify such happenings? I was told through the grapevine that CVS is leaving, and that Trader Joe's will inhabit the old CVS red brick building. How wonderful would that be!?! Talk about trading up! Interesting....When the NorthEast project was on the table, Trader Joe's (apparently) did a market study and decided no. Maybe now with the Barlow activity - more interested? I know I am in the minority, but I prefer CVS to other intown alternatives. But changing to Trader Joe's won't impact traffic at all! Are you sure this isn't just a mixup with TJ's previous potential interest in Redwood Marketplace? That location is much larger and much more the size they would want. While CVS' location is much better in terms of daily traffic, it's on the small side for one of their stores. There's already a large number of supermarkets in town, I'd be surprised if another opening didn't cause the closure of another. It's not a mix-up. My friend's friend told him this 'news'. Could be a possibility, or something signed, sealed & delivered. I am searching to find somebody who might know how to get accurate information/verify what I've been told. That's why I posted. This would be good news, having CVS leave and Trader Joe's take their place. Can anyone verify that this is true? I don't shop at CVS in Sebastopol or elsewhere, except as a last option. Our local Rite Aid has improved their array of merchandise, perhaps in response to the CVS' new store downtown. If TJ's moved in to the present CVS facility, I'd shop there instead of at the Santa Rosa TJ's. How many other Sebastopolians (and commuters passing through) who presently do not shop at the Sebastopol CVS would begin to patronize a TJ's at that location? I would expect the traffic delays at that corner to be significantly longer than they are now. Whatever happened to objections to the traffic that CVS was projected to generate (and which doesn't seem to have happened)? TJ would generate an enormous increase in comparison, but nobody seems to care. I believe if we have any integrity, we do have consistent standards that we apply, regardless of our opinions. That would preclude having a chain (Peet's Coffee) store occupy a location in town, that would preclude allowing any chain (Trader Joe's) business from occupying space in town, but who believes we have integrity? If true, it's Bye Bye Whole Foods! Thing I dislike of Trader Joe's is all the plastic wrapping on ....Vegetables/Fruits. Last edited by Barry; 02-01-2019 at 12:20 PM. Yes, we would, especially since Whole Foods/Amazon dropped, one by one, all the items we used to shop for there. Last edited by Barry; 02-01-2019 at 12:21 PM. Last edited by Barry; 02-01-2019 at 12:22 PM. Interesting. I simply wanted to know how to verify the news/rumor and nobody could help me w/that. Instead there was thought & comment on .... ... ... , as if it's going to happen. Seems like my innocent inquiry threw many of you into delusion thinking & conversation. I'm so sorry. I learned today that I can go to the city planning department to get the information I want. They will know. This grapevine is clearly more like the telephone game. I'm sure you learned from the city that the downtown cvs is. Peets is building a new coffee shop in their parking lot. The old cvs site is still for rent for 22k/month. It is still owned by cvs and traderjoes got the sebtown love message but declined cause the site does not meet their criteria. Biggest hurtle, residential proximity. They run their trucks early am and like bigger commercial zones to avoid waking neighbors. Well that's good news. We don't need a Trader Joe's in Sebtown. Last edited by Barry; 02-02-2019 at 08:59 AM. Hey, thank you for being sane. I'm going to the City Planning office on Monday to begin my path in the same direction. I vow to never ask WaccoBB something that I can find out at the City Planning Office, Gas Station, Bike Lane or Cross Walk. Last edited by Barry; 02-03-2019 at 12:44 PM. Returning the attitude, I'm sure you'll find tons of info there. Afterall, CVS hasn't closed and TJ's wouldn't have needed to file for a business license yet. ... I vow to never ask WaccoBB something that I can find out at the City Planning Office, Gas Station, Bike Lane or Cross Walk. Asking here is fine... and researching the definitive answer and sharing it with us is even better! I lived in Palo Alto for many years. From time to time there would be rumors that Trader Joe’s was coming to town. I think the rumors started because people were merely wishing they would come. After many years Palo Alto did get a Trader Joe’s. Soon afterwards, a beloved smaller market went out of business and I wondered if that was the reason. I’d rather support our wonderful local markets in Sebastopol (but I admit to going to TJs in Santa Rosa every few months to stock up on some staples). Straight from City Planning: 'CVS is not leaving, as far as I know'. I hung in there and asked: 'short of a top secret situation, would you know such a thing?' 'yes'. Okay, I feel certain. btw folks, it wasn't about TJ's for me. It was ALL about CVS getting their disgusting, cruel business outta here. I'm the Sebastopol newbie, so I don't know what your history with CVS is. It sounds bad, but may I offer a little different perspective? please without getting pummeled. My daughter and I moved here from out of state almost 4 years ago. We used the Rite Aid and it was bad. My daughter's condition is considered medically fragile and getting her medications accurately is pretty important. They couldn't get the meds right and they couldn't keep them in stock. So we went to Safeway. The experience was not good there either. I try to respect the Sebastopol fight because I know you all stand for some pretty world-changing views, but I finally broke the picket lines and went to CVS. I love the pharmacist there. She knows my daughter's name. She asks how she is. She knows what medications she's on and she keeps them in stock. She also showed me how I was overpaying. You may not like CVS the corporate dicks that they are, but the people here in Sebastopol who work there..well, I've had a really good experience them. I understand your unique health requirements, but, for me and many others, CVS will always be a shi_hole business operated and staffed by slimy maggots* that we will never patronize, here or elsewhere. Last edited by Barry; 02-07-2019 at 10:01 AM. Trader Joe’s is a terrific grocery store and I have called their direct hotline to request a store in Sebastopol or Forestville, over last few years. It was explained to me that if the right space/location became available they are looking into opening a store in west Sonoma County. Supply and demand. 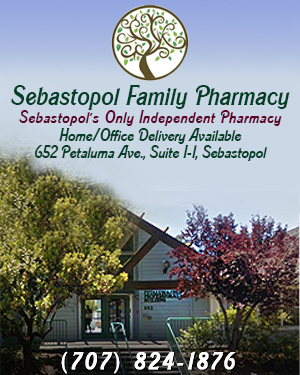 I know that I would shop only there not forced to shop at the extremely overpriced grocery stores in Sebastopol. Really? If you can afford Whole Foods then you’re wasting money but you probably can afford it. Single or older people cannot. TJs has affordable healthy 1-2 person meals that the middle class or fixed income could survive on. And maybe other Sebastopol stores would lower prices to keep customers? I find the hype about prices at Whole Foods tiresome. If you stick to the luxury items, it's expensive. But if you're just trying to get a well-rounded organic diet into your kitchen, it compares favorably with most places. I've been shopping there on a budget for years and appreciate that it serves as a one-stop shop for me. When friends have taken me to Trader Joe's, I've been disappointed every time. Last edited by Barry; 02-08-2019 at 08:36 AM. Yeah, as I've said before here, I really support the local non-chain stores--Community Market, Andy's, and Bill's if you're heading out to the Coast on Bodega Highway. And--of course the Farmer's Market in the square on Sundays. Fresh, local, organic, etc. May cost a bit more but you're keeping local farmers in business. and the music and fun visits with friends are great. Whole Foods has tanked since Amazon took over. Their selections are not nearly as well stocked; they don't bring in a fraction of the local goods they used to. They only evaluate new products semi annually now instead of regularly. Most of the staff isn't the same either (which shows how Amazon has treated them). On the other hand, I'm not a fan of TJ's and their prepacked buy it as a bunch or not at all produce. Their specialty in-store only brand items, don't compensate.